It’s pretty amazing what happens away from the action at a state tournament. Once the games are played and the reaction begins, some pretty neat things develop. Case in point was a tremendous photographed issued via Twitter on Saturday afternoon by Reid Olson, the athletic director at Lyle High School. Lyle and Austin Pacelli have a cooperative girls basketball team, and the Athletics made history by getting to state for the very first time. They played three games in three days, finished fourth in Class 1A and were a worn-out bunch by the time it was all over. The photo Tweeted by Olson showed the interior of a school bus with very few heads visible. You see one girl holding the fourth-place trophy on her lap and most everybody else is down for the count, sleeping on the ride home where the team would be welcomed by both school communities. Another photo was issued from the Twitter account of the Norman County Fair. 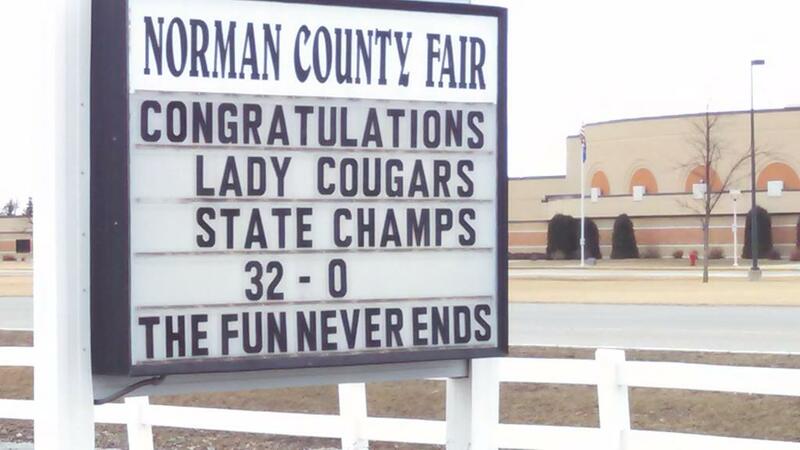 Ada-Borup is in Norman County, and those who have been there (as I have) know that the county fairgrounds are right across the road from the school. Ada-Borup won the Class 1A state title with an 82-65 win over Maranatha Christian at Williams Arena, giving the Cougars a 32-0 record and the honor of being the only undefeated girls or boys basketball team in Minnesota this season. A welcome home celebration was also held in Ada on Saturday night, and you can be sure there will be some basketball players having their picture taken with that sign. The Cougars won their third girls basketball championship behind a balanced offensive attack and a strong defense. Miki Lee scored 22 points, Elizabeth Birkemeyer had 20, Lexi Merkens 17 and Haley Poehler 10. Maranatha’s Lexi Lee scored 32 points, the highest total in the tournament. The Eagles won their first state title in their first trip to state and broke two tournament rebounding records. They set a new single-game record with 71 rebounds Saturday, breaking the mark of 67 set by Archbishop Brady in a 1979 game against Redwood Falls. Dover-Eyota also set a three-game tournament record with 171 rebounds, breaking the mark of 156 set by St. Paul Central in 2007. Trailing 55-51 with 5:44 left, the Eagles outscored the Mainstreeters 20-3 down the stretch. Brandi Blattner led Dover-Eyota with 25 points, Megan Hintz had 24 and Madison Nelson 15. Sauk Centre’s Maesyn Thiesen scored 23 and Mauren Thiesen had 14. The Pirated defeated the Tigers in the championship game for the second year in a row, not needing three overtimes as in last year’s contest. Mikayla Hayes led the Pirates with 13 points while Hannah Schaub and Feyisayo Ayobamidele each scored 11. Marshall’s Marah Mulso scored 15 points, and Sarah Buysse and Morgan Saugstad scored 10 points each. The Royals closed a 30-1 season by beating the defending state champion Lightning. Nia Hollie led the way with 26 points for Hopkins, TT Starks had 16 and Ashley Bates 15. Eastview was led by Madison Guebert with 19 points, Samantha Trammel with 12 and Erika Schlosser with 11. Class 1A/ Brooke Walter, Sarah Holtz, Lyle/Austin Pacelli; Emily Stienessen, Taylor Reiss, Minneota; Alaina Jarnot, Lexi Lee, Jaclyn Jarnot, Maranatha Christian; Haley Poehler, Miki Lee, Lexi Merkens, Ada-Borup. Class 2A/ Kiley Borowicz, Kacie Borowicz, Roseau; Sarah Kaminski, Gracia Gilreath, Minnehaha Academy; Madison Nelson, Brandi Blattner, Megan Hintz, Dover-Eyota; Madison Moritz, Mauren Thiesen, Maesyn Thiesen, Sauk Centre. Class 3A/ Kristin Scott, Kasson-Mantorville; Rachel Heussner, Meghan Mandel, Orono; Sarah Buysse, Morgan Saugstad, Marah Mulso, Marshall; Mikayla Hayes, Hannah Schaub, Ann Simonet, Feyisayo Ayobamidele, Park Center. Class 4A/ Taylor Koenen, Shakopee; Bobbi Brendefur, St. Michael-Albertville; TT Starks, Nia Hollie, Ashley Bates, Viria Livingston, Hopkins; Madison Guebert, Samantha Trammel, Rachel Ranke, Hana Metoxen, Eastview. The biggest moment of the day Friday for Ada-Borup girls basketball coach David Smart didn’t come when senior Miki Lee scored the go-ahead basket in the lane with seven seconds to play. The biggest moment didn’t come when Austin/Lyle Pacelli junior Courtney Walter narrowly missed a three-point shot with one second to play. It didn’t come when the horn sounded on Ada-Borup’s 54-52 fingernail-grinding victory over the Athletics in the Class 1A state semifinals at Williams Arena. As exciting as all that was, the big moment for Smart came early Friday morning, when his daughter Kelli and her husband, Steve Trudeau, became parents of a little girl. 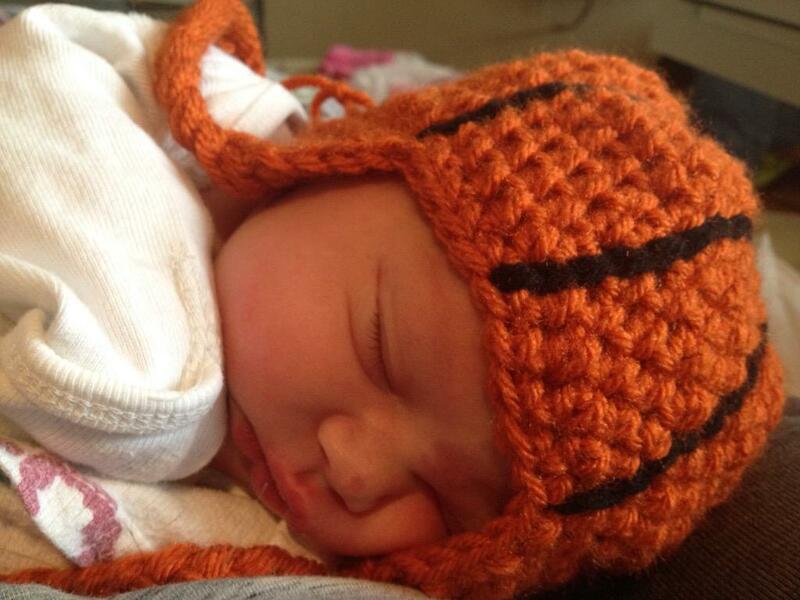 Alexis Nicole Trudeau, who was born in Fargo, N.D., is David and Becky Smart’s first grandchild. The plan was a normal delivery but the Smarts received an early-morning text from their son-in-law that a caesarean section was in the works. “Once they decided that, we knew it was just going to be a matter of time,” David said. The team learned the news during breakfast at their hotel when Becky showed everyone a photo of the baby on her phone. Kelli played basketball for her dad, as did the Smart’s other child, Nicole. Kelli is a teacher and coach at Northern Cass High School in Hunter, N.D.
“I was a pound off, I got the inches right but I got the name wrong,” said the very happy coach/father/grandfather. It’s a good thing teams are told to bring both sets of uniforms to every game at the state tournament. Maranatha Christian came out for warm-ups in the Class 1A semifinals wearing their black home uniforms while Minneota was wearing its blue home uniforms. Maranatha was the visiting team, however, and should have been wearing white. So the Mustangs interrupted their warm-ups, returned to the locker room for a quick change, came out in their white uniforms and resumed warming up. Crisis averted. Maranatha coach Chris Buerman said nothing rattles his team. “We’ve worn those so many times, they put them on and away we went,” he said. Lyle/Austin Pacelli, a cooperative team with students from both schools, made history by advancing to the Class 1A state tournament for the first time since the coop was formed in 2000. The Athletics came into the tournament unseeded, defeated third-seeded Mountain Iron-Buhl 66-47 in Thursday’s quarterfinals and gave Ada-Borup (at 31-0 the only undefeated girls or boys team in the state) all it could handle Friday. Lyle/Pacelli’s record over the last three seasons is 73-9 (23-4, 24-1, 26-4). Minneota senior Taylor Reiss reached a big career milestone Thursday at Mariucci Arena, but becoming only the 13th girls basketball player in Minnesota history to score 3,000 points barely registered on the scale of what was important to her. The fifth-seeded Vikings opened the Class 1A state tournament with a harrowing 69-68 victory over fourth-seeded Browerville. Reiss – who came in with 2,989 points -- had six points at halftime and reached 3,000 with two free throws early in the second half. She finished with 13 points in the game and 3,002 in her career with two games to go. Actually, she finished the game on the bench after fouling out. But thanks to some hustle and sharpshooting by the rest of the Vikings, they moved on to Friday’s semifinals against Lyle/Austin Pacelli at Williams Arena. “I believed in my teammates and I knew they could do it, even with me sitting on the bench,” she said. The 5-foot-10 Reiss (pictured) joins a list of some of the top scorers in history, including Rebekah Dahlman, Carlie Wagner, Tayler Hill, Katie Ohm and Janet Karvonen. Minneota was very nearly one and done Thursday. Browerville led by 11 with 13:53 to go before an 18-1 Vikings run gave them a seven-point lead. Browerville led again with 2:25 remaining but Minneota held on down the stretch and LeAnn Jerzak secured the victory with two free throws with 15 seconds left. The 5-foot-5 Jerzak, who averages less than four points a game, scored 14 on 5-for-7 shooting. Reiss – who will play volleyball at South Dakota State -- said the only other time she fouled out of a big game was in last season’s state championship game; in that case she fouled out in the final minute of a 61-53 loss to Win-E-Mac, when the outcome had already been decided. “I haven’t had to do that a lot,” she said. “But I believed in my teammates and I knew they could do it, even with me sitting on the bench. When the horn sounded, no one was more excited than Reiss. She sprinted off the bench and began hugging her teammates. Not in celebration of 3,000 points, either. Reiss was a varsity player in eighth grade and has been a starter since ninth grade. This is the fifth trip to the state basketball tournament for her and teammates Emily Stienessen and Payton Boerboom. “She’s meant a lot to us, obviously,” Johnston said of Reiss. “She’s been a big key, core part of this. She’s had some great surrounding players, but she’s a very unselfish player. She’s really matured over the years. --Just like on Wednesday, we had more sumo sightings at Mariucci Arena on Thursday. This time it was four students from Ada-Borup in the stands all pumped up. --Springfield coach Paul Arnoldi suffered a torn Achilles tendon in his right leg seven weeks ago. Doctors recently cleared him to start putting weight on his leg, but he wears a “boot” and has a scooter on which to rest his leg and move around. It’s never a good sign when you see two people in an emotional embrace and one of them is in tears and on crutches. Kasson-Mantorville girls basketball coach Ryan Haraldson leaned down and wrapped 5-foot-4 senior guard Cori Kennedy in a bear hug outside the KoMets’ locker room Wednesday afternoon, crushed that the player he called “our heart and our soul” will not be able to play any more in the Class 3A state tournament. The good news for Kasson-Mantorville? The unseeded KoMets defeated third-seeded New Prague 62-55 at Mariucci Arena in the state quarterfinals, guaranteeing themselves two more games. The horrible news? Kennedy will be on the sidelines. Cori went down 2 minutes, 19 seconds into the game, was helped to the bench and then given assistance leaving the arena floor. She returned later with her knee tightly wrapped and using the crutches to ambulate. She sat behind the bench; a few times late in the game she managed to hop up on her good leg and cheer for her teammates. But make no mistake, this was a big loss for the KoMets. Kennedy is the second-leading scorer in school history, the No. 2 scorer on this year’s team and she leads the KoMets in three-point scoring. This is her sixth trip to a state tournament: two in basketball, three in softball and one in volleyball. She will play collegiate softball at Minnesota State Mankato. Senior Kari Pingel took over for Kennedy and did an outstanding job. Pingel played 30 minutes, scoring six points with four rebounds and four assists. Kennedy has never missed a game in her varsity career. She’s so tough that when she had an injured right shoulder as a sophomore she shot lefthanded during one game. “That’s why this is crazy,” KoMets senior Taylor Weibke said of seeing Kennedy go down. “I was in shock, my mind just kind of shut down for a second. I think all of us were worried, of course, because she’s one of our strongest players and leaders on the court. Kasson-Mantorville will face a big test in Thursday’s 2 p.m. semifinals at Williams Arena, when they face defending champion and second-seeded Park Center. The Pirates defeated Richfield 72-57 Wednesday. --After Park Center’s victory over Richfield, Pirates coach Chris VanderHyde was asked about the differences between last year (when the team was at state for the first time) and this year. A year ago the team’s star was Cayla McMorris, who now plays at the University of Wisconsin. --My favorite band members of the day: Two horn players from Fairmont performed while wearing inflated black sumo suits. I’m not sure if there was a message there, but the look was outstanding. When Princeton and Marshall squared off in Tuesday night’s Class 3A girls state basketball quarterfinals at Target Center, there were a few similarities. Both teams are the Tigers, for example. And the colors of both schools are orange and black. The familiarities, however, went much deeper. Third-year Princeton coach Andy Fenske, 27, is a 2006 graduate of Marshall, where girls basketball coach Dan Westby was his physical education and health teacher in seventh and eighth grade. One of the hurdles for Fenske was what to call Westby, 55, who has been a coach (he also coaches Marshall’s volleyball team) for 26 years. Fenske (pictured with Westby) has done a marvelous job at Princeton. The Tigers were 12-15 in each of the last two seasons and finished this season with a record of 20-9 after losing to Marshall 65-30 Tuesday. A year ago, with no seniors on the team, Princeton lost to North Branch by two points in the Section 7 playoffs. That defeat has driven them since last season ended. “The big thing throughout the offseason was, ‘Remember that feeling. We don’t want that to happen again,’ ” Fenske said. “The girls had 6:30 a.m. workouts in the summer and they showed real dedication and heart. We have six seniors on the team and they’ve been pushing us the whole way. An impact has certainly been made this season. Tuesday’s game was Princeton’s inaugural trip to the girls state basketball tournament; the Tigers boys’ last appearance was in 1932. Fesnke is familiar with the Marshall players as well as the coach. When he was a student at Gustavus Adolphus College he coached many of the current basketball players in summer tee ball. His father, Mike, is an elementary physical education teacher in Marshall, and many of the basketball players had Mike as a teacher. Westby said, “The thing I remember about Andy was that he was always hard-working and very respectful. I remember Andy as a high school football player; he was maybe a little undersized but he was asked to play on the offensive line and he got everything he could out of himself. He was a great, great kid. I always enjoyed him as a student. --Coaches Rich Decker of Rochester Mayo and Brian Cosgriff of Hopkins entered their teams’ Class 4A quarterfinal matchup Tuesday with a combined total of exactly 1,000 career victories. Decker had won 584 games, most of them as the boys coach at Rochester Lourdes, and Cosgriff came in with 416 wins. Cosgriff’s total is 417 after the Royals’ 62-35 victory over the Spartans. As usual, this has been a very good season for the Hopkins girls basketball team. The Royals take a record of 27-1 and the No. 1 seed into Tuesday’s 10 a.m. Class 4A state tournament quarterfinal game against Rochester Mayo at Target Center. Hopkins is one of the premier girls basketball programs in Minnesota, with state titles in 2004, 2006, 2011, 2012 and 2013. Coach Brian Cosgriff is wary of the quarterfinal matchup, mostly because the coach on the other bench is Rick Decker, the former boys coach at Rochester Lourdes who is in the boys basketball coaches Hall of Fame and has the Mayo girls at state for the second time in three years. Brad was treated for lung cancer about a year ago and one lung was removed. He was cancer-free for more than a year. But one Saturday last fall, everything changed. Brian Cosgriff is a member of the chain gang at University of Minnesota football games. While tailgating with his brother and others after a game at TCF Bank Stadium, something wasn’t right. Brad’s wife took him to the emergency room. Test revealed a brain tumor in the front of his head and two in the back. The next day Brad was undergoing major surgery. The tumor in the front of Brad’s head was removed and the other two are being treated by CyberKnife radiation. As news of Brad’s condition spread, the basketball team became involved in the efforts to support Brad, Brian and the Cosgriff family. Players, coaches, families and fans began wearing them at the game next day. Brad wasn’t able to attend, but he was on hand when the Royals defeated Minnetonka last Wednesday in the section title game. The Hopkins student body and basketball team is very eclectic, with students from more affluent areas of western suburbs as well as from north Minneapolis. Standing together for Bradley Cosgriff has brought the team even closer together. Little kids shooting hoops on asphalt courts. Teenagers gathering inside the school gym to work on their skills when they could have their faces buried in electronic devices. Small towns filled with people who appreciate hard work and tradition and take great pride in their hometown teams. Rushford-Peterson and Melrose, that’s what we’re talking about here. Those two teams took home boys basketball state championships Saturday, and if you listen close you can probably hear all the hoops and hollers still emanating from inside the borders of those communities. The two stories are not identical. Both teams have won previous state titles, but the time frames are much different. Rushford won the Class 1A championship in 1989 and 2006, finished fourth at state in 2010 and third in both 2012 and 2013 before a runner-up finish last season. Rushford-Peterson defeated Maranatha Christian Academy 51-44 Saturday at Target Center, handing the Mustangs their second Class 1A championship-game defeat in three years. Melrose, on the other hand, has waited a long, long time. The Dutchmen last came to state (and won a championship) in 1974, when the great Mark Olberding was the star. Forty-one years later they held off Caledonia 63-51 to capture the Class 2A title. Hard work and tradition are main ingredients for both teams. “When I was a little kid we won a state championship,” said Rushford-Peterson senior Cole Kingsley, who played on an ankle that was injured in Thursday’s quarterfinals. He was talking about 2006, way back “when I was a younger kid, seeing them play up here, it was a dream of all of us. For Melrose, the 41-year drought between state tournaments has been all the tougher because the Dutchmen have come close to many times. Assistant coach Daryl Oja, who was the head coach for 28 years, has seen a lot of near misses. He was talking while the Dutchmen were cutting down the net after the championship game. The Melrose fans roared each time a player climbed a ladder and took a snip with a scissors. The Islanders became only the fourth team in the 103-year history of the tournament to win four consecutive state titles. They did so in convincing fashion against the Governors. The other teams to complete the four-peat were Southwest Minnesota Christian (Class 1A, 1999-2002) and Minneapolis Patrick Henry (3A, 2000-03). Apple Valley was strong down the stretch and held on for the win in a back-and-forth game between the top two seeds in the tournament. Top-seeded Champlin Park suffered it first loss after 31 victories and the Eagles finished the season with a 30-2 record. Apple Valley lost to Champlin Park in late December and to Eastview in February. It was Apple Valley’s second state title in three years. Class 1A/ Petric VanErp, Eric VanErp, Battle Lake; Austin Bulthuis, Taylor Slagter, Central Minnesota Christian; Damario Armstrong, Jeremiah Hanson, Jake Meyen, Maranatha Christian; Charlie Krambeer, Kyler Paulson, Alex Vix, Rushford-Peterson. Class 2A/ Ade Lamu, Trenton Krueger, St. Croix Lutheran; Jonah Breiter, Jeff Lewis, Maple River; Owen King, Colton Lampert, Kyle Sorenson, Caledonia; Tyler Braegelmann, Dillon Haider, Drake Meyer, Melrose. Class 3A/ Gorg Alhag, CJ Ayers, Mankato East; Joey Kortuem, Oliver Smith, Waconia; Eric Elliott, Jalen Mobley, Malik Jones, St. Paul Johnson; Sacar Anim, Joshua Collins, Jarvis Johnson, DeLaSalle. Class 4A/ Steffon Mitchell, Booker Coplin, Shakopee; Carter Brooks, Drew Stewart, Lakeville North; Gary Trent Jr., Tre Jones, Brock Bertram, Apple Valley; Marty Hill, JT Gibson, McKinley Wright, Champlin Park. Two people were honored at halftime of Saturday night’s games. During the Class 3A game, Dave Harris of Alexandria was honored as the inaugural recipient of the MSHSL Outstanding Media Service Award. Dave recently retired after a distinguished 48-year career as a sports broadcaster at KXRA radio in Alexandria. At halftime of the Class 4A game, recently retired MSHSL director of information Howard Voigt was honored. Howard served the MSHSL and the students of Minnesota during a distinguished 25-year career. A lot of newsworthy events took place in 1974. Hank Aaron broke Babe Ruth’s home run record, Stephen King published his first novel, Muhammad Ali knocked out George Foreman at the Rumble in the Jungle in Zaire, and Richard Nixon resigned as president. In Melrose, Minnesota, however, the thunderclap that lives to this day came when the Melrose Dutchmen won a boys basketball state championship. The team finished a perfect 27-0 season by beating Mound 38-32 in the Class A title game and Class AA champ Bemidji 58-52 in a game pitting the two class winners. Forty-one years later, the Dutchmen are back. With a 55-40 victory over top-ranked and top-seeded St. Croix Lutheran on Friday at Target Center, Melrose will play in Saturday afternoon's championship game against second-seeded Caledonia, a 74-58 winner over Maple River in Friday's second 2A semifinal. Not only is this Melrose’s first state title game since 1974, it is their first appearance at state since 1974. Bus after bus and car after car came to the Twin Cities for this week’s games, and the purple-clad Melrose faithful have been the most excited fans at Target Center. “Everybody is town is so jacked about this, so jacked,” said coach Ryan Dusha. “You walk around town, the grocery stores, you go up Main Street, everyone’s got smiles on their faces. And our contingent here in purple is so amazing, it’s so much fun. The star of that 1974 team was Mark Olberding, who went on to play at the University of Minnesota before a 12-year career in the ABA and NBA. He spent six years with the San Antonio Spurs and now lives in San Antonio. Olberding, now 58 years old, returned to Minnesota to watch Melrose’s state quarterfinal win over Redwood Valley on Wednesday and spoke to the team before the game. Melrose junior Colton Meyer, who made six of seven shots and scored 12 points against St. Croix Lutheran, said meeting and hearing from the biggest name in Melrose sports history was special. “He’s the best player to come out of Melrose and one of the best ones to come out of Minnesota and make it to the NBA,” Meyer said. “It meant everything to us. To hear from an NBA player and a former state championship player, it meant everything. Oh, something is certainly working. The Dutchmen were seeded fourth at state, which is a middling label in an eight-team field. And here they are after beating the five seed and the one seed, right where they wanted to be … if that’s how they looked at things. Olberding had business commitments in San Antonio and returned there Thursday morning. --Rushford-Peterson’s Tom Vix has his 15th team at state, which ties for the most among boys basketball coaches along with Ken Novak Jr. of Hopkins. Next are Ove Berven, Austin, and Bun Fortier, Bemidji (14), Bob Brink, Rocori, and Dave Thorson, DeLaSalle (13), Zig Kauls, Mounds View (12), Bob McDonald, Chisholm, and Lynn Peterson, Staples (11), and Vern Simmons, St. Paul Johnson (9). Rushford-Peterson boys basketball coach Tom Vix had a good feeling going into Thursday’s Class 1A state quarterfinals at Williams Arena. The top-seeded Trojans would be facing unseeded Fond du Lac Ojibwe in the day’s first game at Williams Arena, but Vix’s positive vibe was all about his own team. The only question is which was higher: Rushford-Peterson’s pregame confidence or their in-game shooting percentage? The Trojans shot 64 percent from the field and made16 of 27 three-point shots, with Charlie Krambeer leading the way. He scored a career-high 33 points, making 12 of 17 shots (seven of nine three-pointers). At one point late in the first half the Trojans were shooting 72 percent. Their shooting percentage coming into the game was 49 percent. “We got some shots to go and the basket just got bigger and bigger and bigger,” said Vix, who is a 30-year head coach and has a team at state for the 15th time. This is Rushford-Peterson’s fourth consecutive trip to state; Rushford High won a state title in 1989, Rushford-Peterson did so in 2006 and finished second in 2005 and last year. Krambeer felt he had something to prove this year. In three games at state last season he made only three of 15 field-goal tries and totaled 11 points. In Thursday’s game he had 11 points in the opening four minutes. “I was just glad I could help my teammates out in a positive way,” Charlie said after the game. Charlie’s previous career high was 23 points and he averaged 13.5 points this season. But he is a senior, and knowing it’s your last go-round can be a pretty strong motivator. Rushford-Peterson knows the state tourney routine as well as any team. They will rest, eat, sleep and prepare for Friday’s semifinal game against Central Minnesota Christian. There’s no way to accurately predict how the shots will fall at Target Center, but Thursday’s game will go down in lots of memory banks. Nevis coach Scott Kramer was wearing a smile after the Tigers lost to Central Minnesota Christian 56-47 in a hard-fought Class 1A quarterfinal game. Yes, the defeat was not what they had hoped for. But the accomplishments of the team – a school-record 26 victories and the school’s first trip to this tournament – made it sweet nonetheless. “It’s very difficult in this situation to get down,” Kramer said. “You have to tip your hat to them. CMC came out and did not give us anything easily. We fought and so did they. “It was a great season for us. I told the kids that this is something they can be proud of. And for our younger kids, they got a taste of this and they’ll work hard to get back. --Roy Ward, a legendary coach and multi-sport official for many years, is attending his 70th consecutive boys state basketball tournament this week. Roy was a longtime coach and administrator for St. Paul, North St. Paul and Tartan schools and was inducted into the MSHSL Hall of Fame in 2001. The doors to Williams Arena hadn’t been unlocked for very long Wednesday morning when the first visitors arrived. It was the Albany High School boys basketball team. And it’s easy to understand why the Huskies got to The Barn so early. They had a big game, and a big day, ahead of them. The test they faced was robust. Their Class 3A state quarterfinal opponent was the DeLaSalle Islanders, who happen to be the three-time defending state champions. Game time was 10 a.m. At 9 o’clock some of the Huskies were lounging on the bench, some had headed upstairs to check out Williams Arena’s cloud-level views. The game? Well, the outcome was what most impartial observers probably expected; DeLaSalle defeated Albany 70-60. It was a whale of a contest, and what happened on the court will join the rest of the tournament's experiences in the Huskies’ memory banks: the police cars and fire trucks that escorted the team out of town on Tuesday, that first walk into an empty Barn, standing for the national anthem, competing with every last ounce they had. The situation was similar in the third Class 3A game of the day. Hermantown, unseeded and playing at state for the very first time, faced second-seeded St. Paul Johnson, which is at state for the sixth time in seven years. Hermantown came within a rimmed-out three-point shot at the buzzer of taking the game to overtime. Johnson escaped with a 59-50 victory, one that was hard-earned against the Hawks. Hermantown coach Joe Schmitz lingered with his team in the locker room, then apologized to the assembled media outside the door for making them wait a bit. “We have some great seniors and we just wanted to send them off the right way,” he said. Albany was not a first-timer at state like Hermantown, but the Huskies had not been to this tournament since 1997 (Wednesday’s game was the school’s fourth trip to state overall). Albany lost, yes. But the Huskies competed so hard that anyone who was in the building will be talking about them for a long time. DeLaSalle led 29-19 at halftime and it was an even matchup after that. The second half was a 41-41 deadlock, with Albany trying mightily to take the thing over. They cut the margin to five points with 1:24 left when Nick Raeker hit a three-pointer, and it was five with 58 seconds to go on a jumper by Kenny Weber. DeLaSalle’s final five points came on three free throws and a layup as Albany was forced to foul. DeLaSalle is not only going for its fourth consecutive state title, but the Islanders’ lineup is packed with Divison I players. Jarvis Johnson will play at the University of Minnesota, Sacar Anim at Marquette and Josh Collins at North Dakota. Sometimes a coach will size up a talented opponent and panic, shredding the normal game plan and going to something new. Schlagel isn’t one of those coaches. “We played other good basketball teams but nobody with the size and length they have,” he said. “A lot of people asked if we were going to change our game plan. To be honest, we played the way we always have. --My favorite mascot of the day: That’s easy. The Governor of St. Paul Johnson. When you consider all the second-place medals that the Hermantown hockey team has hauled home from the state hockey tournament, there are the beginnings of a pretty substantial silver mine up north. Saturday was, well, how to put this? It was loss No. 6 for Hermantown in Class 1A state championship games over the last six years. The phrase “six of one, half dozen of the other” doesn’t come close to doing this situation justice. Anyone who has a beating heart feels for the Hawks … six tries, six second-place finishes and a whole bunch of what-ifs. After falling 5-4 in overtime to East Grand Forks at Xcel Energy Center, Hermantown coach Bruce Plante referred to “guys in the locker room bawling their eyes out.” That’s a hard scene to get out of your head … and it’s been this way for six years in a row for the Hawks. Imagine. It was the second consecutive title-game victory for East Grand Forks over Hermantown. A year ago the score was 7-3. “We made one more play than they did,” said Green Wave coach Tyler Palmiscno. Yes they did, and the Hawks came oh so close to finally getting over the golden hump. East Grand Forks led 2-0 after the first period, Hermantown tied it 2-2 in the second. Dixon Bowen scored late in the second period for the Green Wave and teammate Austin Monda’s second goal of the game early in the third put East Grand up 4-2. And then, wham! Wyatt Aamodt and Eric Gotz scored for the Hawks 17 seconds apart late in the third period, making it 4-4 as regulation ended. The luck went the other direction when Tanner Tweten got the game-winner (his second goal of the game) for the Green Wave 3:34 into overtime. “It’s a hockey game,” said Hermantown senior Nate Pionk. “You can’t just quit. You have to come back. There’s the separation between finally winning gold medals and returning home with another bag of silver. And as happy as the East Grand Forks players were, they understood how it felt in the other locker room. The top-seeded Panthers completed a 31-0 season with a dominating victory over the unseeded Greyhounds (16-11-4). The Poehling brothers – seniors Jack and Nick and sophomore Ryan – all scored, as did Angelo Altavilla, who was named the winner of the 2A Herb Brooks Award. North outshot East 23-13 in a defensive-oriented game. Ryan Peterson scored for the Greyhounds in the third period to make the score 3-1 before Nick Poehling scored into an empty net. Class 1A/ Jack Becker, Mahtomedi; Tanner Breidenbach, St. Cloud Apollo; Eric Gotz, Luke Olson, Nate Pionk, Ryan Kero, Wyatt Aamodt, Hermantown; Dixon Bowen, Grant Loven, Josh Weber, Tanner Tweten, Trevor Selk, East Grand Forks. Class 2A/ Garrett Wait, Edina; Peter Tufto, Seamus Donohue, St. Thomas Academy, Alex Spencer, Ash Altmann, Gunnar Howg, Ryan Peterson, Duluth East; Jack McNeely, Jack Poehling, Jack Sadek, Nick Poehling, Ryan Edquist, Lakeville North. --This year's total of 135,618 fans is a record for the tournament. The previous high was 129,643 in 2008. --The Chicago Blackhawks lead the NHL with an average home attendance of 21,720. Friday night's crowd of 21,609 for the Class 2A semifinals would rank No. 2 in the NHL. --Saturday’s championship games marked the fifth time in the 1A/2A era with three finalists from northern Minnesota. There were four in 2007: Roseau, Grand Rapids, Hermantown and Duluth Marshall. The other years with northern teams were: 1994 (Warroad, Moorhead, Hibbing), 1995 (Duluth East, International Falls, Moorhead) and 1998 (Duluth East, Eveleth-Gilbert and Hermantown). --Edina was the two-time defending state champ. --The Hornets had defeated Duluth East 7-1 on Dec. 30. --Edina was seeded second in the eight-team field and East was one of three unseeded teams. --Edina came into the semifinals with a record of 25-1-2. East was 15-10-4. Not an upset? OK, coach. “I’ve been here 17 times and I’m kind of used to it,” Randolph said of the state tournament hoopla. It’s rare that he shows much emotion, but as the horn sounded Friday he raised both arms as well as a big grin. He was referring to the second semifinal between Eden Prairie and Lakeville North. The theme in the Hounds’ prior two games went like this: fall behind by three goals and mount a tremendous comeback. That didn’t happen against Edina, which made East goaltender Gunner Howg happy. Edina opened the scoring when Patrick Haug got a goal 10 minutes into the first period. It was all East after that; Luke Dow scored later in the first period, Nick Altmann scored 31 seconds into the second and Ash Altmann finished it off with less than three minutes left in the third. Top-seeded North (30-0) broke open a close game with two third-period goals and moved into the title game against Duluth East. The score was 2-2 after two periods, but the Panthers’ Max Johnson, Chaz Dufon, Jack Poehling and Luke Seper scored in the third. Eden Prairie (19-10) will face Edina in Saturday’s third-place game. SIXTH TIME THE CHARM FOR HERMANTOWN? Turn back the clock to the 2014 Class 1A state tournament. And keep turning that sucker back all the way through 2013 and 2012 and 2011 and 2010. And then look at the Hermantown Hawks as they prepare for Saturday’s state championship game. This is a very familiar perch for the top-seeded Hawks (27-2-1), who will face third-seeded East Grand Forks (25-4) in the title game at noon. The same two teams met for the state championship last year, with East Grand Forks winning 7-3. Hermantown was also on the low end of the score in the previous four title games. So Saturday’s game will be their sixth title game in a row, and they enter with renewed hopes of finally taking home the big trophy. East Grand Forks, which advanced with s 5-2 win over Mahtomedi, lost to Hermantown 3-0 on Dec. 31. That’s hopefully a positive omen for the Hawks, but after going donut-for-five in five straight title games, you still have to wonder if there’s an angry ape on your back. “I just try to get ‘em to play our game,” Hermantown coach Bruce Plante said. “And if our game is good enough we’ll win. If we don’t, we won’t. We want to play without nerves or fear and we try to play the best we can. Two days after an 8-0 quarterfinal win over Spring Lake Park, the Hawks played a workmanlike game Friday. Jesse Jacques scored in the first period and Cole Koepke did the same in the third. Plante called Koepke’s goal the key moment in the game. Grant Loven had a hat trick for the Green Wave and Trevor Selk and Austin Monda also scored. The score was 2-2 in the second period after the first two goals by Loven and Mahtomedi scores by Joe Forciea and Tim Kuivinen. But East Grand Forks did the rest of the scoring, finishing with a 33-20 advantage in shots on goal. --Friday night's Class 2A state hockey attendance was 21,609. That's the largest crowd for an indoor hockey game in Minnesota ... ever. Another hockey attendance note: Every session except Wednesday evening has set an all-time record for that session. --Getting to the state tournament can be simple or not so simple. For example, fans from East Grand Forks and Mahtomedi faced much different journeys. East Grand Forks High School is 327 miles from Xcel Energy Center; Mahtomedi High School is only 14.6 miles away. Third place/ Mahtomedi vs. St. Cloud Apollo, 9 a.m.
Third place/ Edina vs.Eden Prairie, 4 p.m.
Championship/ Duluth East vs. Lakeville North, 7 p.m. The most dangerous lead in hockey is a three-goal margin over Duluth East. That’s the lesson for teams who have faced the Greyhounds in recent days, including St. Thomas Academy in Thursday’s Class 2A state quarterfinals at Xcel Energy Center. The Cadets held a 3-0 lead after the first period and were in front 5-2 heading into the third period. But here came the Greyhounds … tying the score 5-5 with two goals in the last three minutes of regulation and winning on a goal by Ryan Peterson – his second of the game -- 91 seconds into overtime. A big rally is nothing new for the Greyhounds, who are unseeded at state and have a record of 15-10-4. In last week’s Section 7 championship game against Elk River they came back from a 3-0 first-period deficit to win 5-4 in double overtime. Their victory over third-seeded St. Thomas Academy (24-5) was a shocker, but the Greyhounds did control some aspects of the game. The most glaring example was their 30-21 advantage in shots on goal. Nick Funk, Luke Dow, Brian Bunten and Evan Little also scored for East; Peter Tufto had two goals and three assists for the Cadets. St. Thomas Academy co-coach Greg Vannelli said, “Once momentum starts going the other way and you can’t stop it, that’s what happens sometimes. It happened really fast. In the postgame press conference, the first question posed to Randolph was basically this: How does your team keep winning these games? He nodded toward the Greyhounds captains, Nick Altmann and Brian Bunten, who were sitting near him. Peterson, he of the two goals scored, explained the East magic like this: “We know we have to work every game. We’re used to coming back and working hard from the first minute of the period to the last minute. And it pays off. This game was much like the Duluth East-St. Thomas Academy contest, but Edina held off a late onslaught by the Lumberjacks. The Hornets led 3-0 after one period after outshooting Bemidji 12-2, but the team making its first tournament appearance since 1986 never went away. Two goals by unseeded Bemidji (23-4-2) in the second period made it a 3-2 game, Edina (25-1-2) got two for a 5-2 score and the Jacks’ Josh Lusby scored with 55 seconds left in regulation to make it 5-4. Edina’s Casey Dornbach ended the scoring with two seconds to go. Matt Masterman scored twice for the second-seeded Hornets. Jack Poehling scored two goals and Max Johnson and Henry Ebenak each scored once as the top-seeded Panthers (29-0) advanced to Friday night’s semifinals. North outshot the unseeded Pioneers 29-17. Jacob Olson scored the goal for Hill-Murray (21-8). Michael Graham and Casey Mittelstadt each scored two goals for the fifth-seeded Eagles (19-9), who will meet Lakeville North in Friday’s semifinals. Fourth-seeded Blaine fell to 22-6-1. Mahtomedi vs. East Grand Forks, 11 a.m.
Edina vs. Duluth East, 6 p.m. There is one big question swirling around the Class 1A boys state hockey tournament: Can the Hermantown Hawks, losers in the last five state championship games, finally take home a first-place trophy? The top-seeded Hawks opened the 2015 tournament in grand style Wednesday at Xcel Energy Center, scoring three goals in the first period and cruising to an 8-0 victory over unseeded Spring Lake Park, which is at state for the first time. Nate Pionk and Ryan Kero each scored three goals for Hermantown. But there has been another question about Hermantown: Are the Hawks considering opting up to Class 2A in future seasons? To that question we have an answer. Now, moving on to a pink bicycle helmet that joined Plante, Pionk and Kero at the postgame press conference. Pionk carried it into the room and placed it on the table in front of him. Obvious question: What’s the deal with the bike helmet? New Ulm came into the state hockey tournament with an 0-8 record in four previous appearances, but the unseeded Eagles gave second-seeded Mahtomedi all they wanted. Mahtomedi came out on top 6-3 but it was a struggle. The score was 1-1 after the first period and Mahtomedi’s lead was 4-3 early in the third before the Zephyrs’ Jack Gunderson scored his second goal and Jack Becker completed a hat trick to secure the victory. Mahtomedi coach Jeff Poeschl said his team played poorly with the puck and has some work to do if they want to win in Friday’s semifinals. “I thought (New Ulm) battled real hard and to be perfectly honest I thought we really struggled,” he said. “We fought it all night long. The defending state champion Green Wave outshot the Spartans 32-17 and Dixon Bowen led the way with two goals. The game was scoreless through the first period and Bowen got on the board in the second period. Third-period goals were scored by Cooper Jerome, Nick Derrick and Bowen into an empty net. Brandon Bissett scored the game’s only goal in overtime, lifting the Eagles into Friday’s semifinals against Hermantown. Breck had 25 shots on goal to 14 for Apollo. East Grand Forks' Bowen made an important decision before the season began. He played 10 games with the Fargo Force of the U.S. Hockey League before the high school season began, and he will return to the Force after this weekend. But nothing was going to keep him from his senior season with the Green Wave. He has a bright future in hockey. He is a Mr. Hockey finalist and he will play collegiately at the University of North Dakota. Some players choose to leave high school early, but many don’t. --Wink of the day/ Mahtomedi’s Jack Becker, sitting on the bench after his third goal and seeing himself on the big screen at Xcel Energy Center, winking at the camera. Bemidji (23-3-2) vs. #2 seed Edina (24-1-2), 11 a.m.
Hill-Murray (21-7) vs. #1 seed Lakeville North (28-0), 6 p.m.